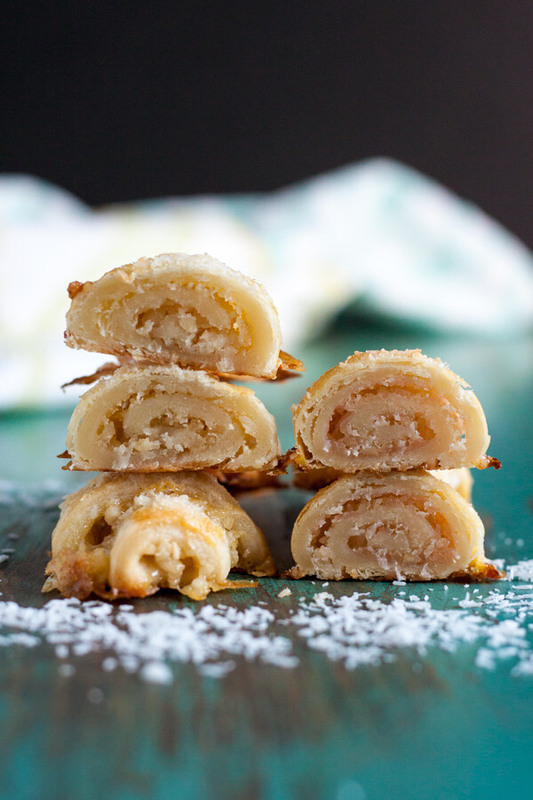 Tropical Rugelach are delicious little bites of tender pastries filled with tropical fruit butter, coconut flake and macadamia nut. They taste like a vacation in your mouth. I’m going to let you in on a little not-so-secret, I have a severe obsession with all things tropical. I’m sure you can already tell from all the talk about Hawaii, and coconut, and macadamia nut, and the list goes on. 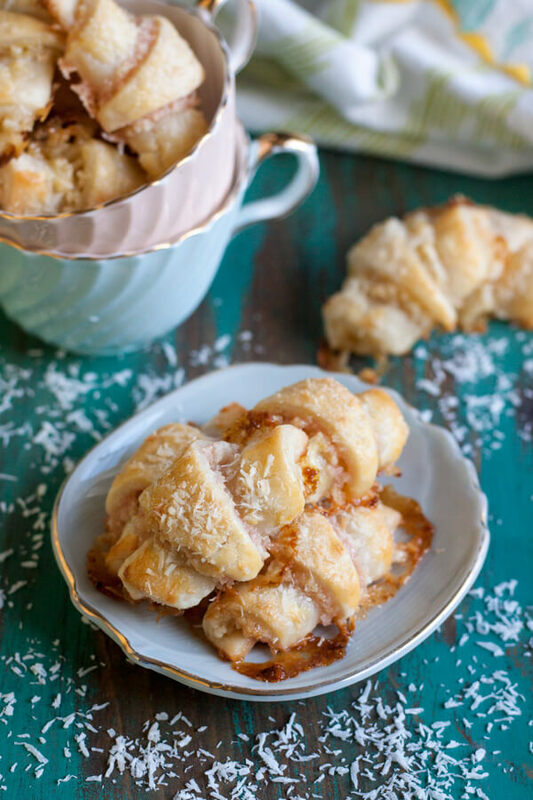 These Tropical Rugelach may be a bit unconventional but I assure you they are perfect for snacking while daydreaming about your next tropical vacation! Make sure to let cream cheese and butter soften at room temperature in advance, especially during colder weather. You can use a knife to cut the dough, but I would recommend investing in an inexpensive pizza cutter for this as it will make the cutting so much faster and easier. I like the one with longer handle. I used guava and lilikoi fruit butter that I picked up during my last trip to Maui. These fruit butter are thick and almost solid when kept in the fridge. If you cannot get your hands on something like these, you can substitute guava jam. 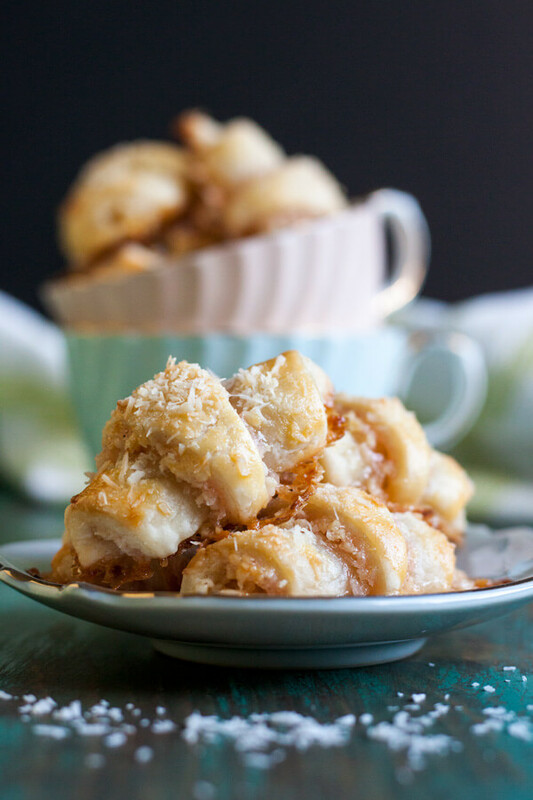 I have bought guava jam from Sprout’s before to make these Coconut Guava Thumbprint Cookies. They’re delicious! I know not all of us are lucky enough to be able to go on a long vacation every year. But food can transport you anywhere you’d like to be in just a few bites. 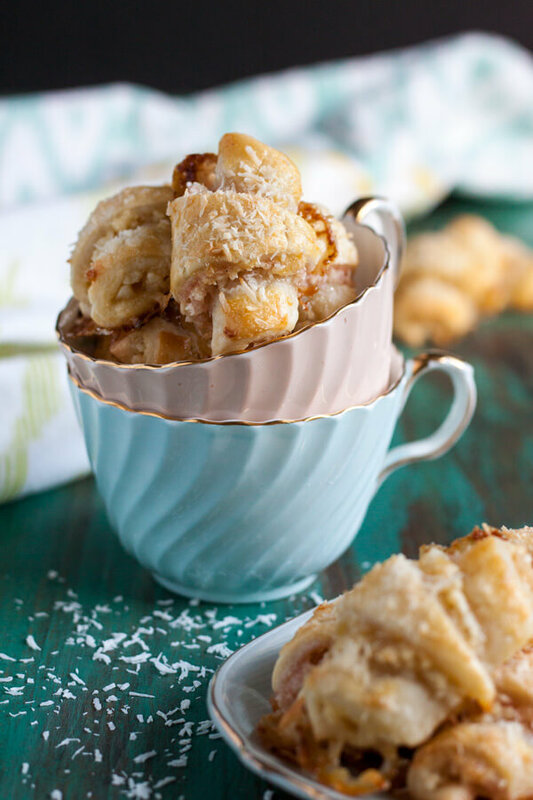 So if you’ve been itching to get to warmer climate, why don’t you turn on your oven and bake these Tropical Rugelach? Cream the soften butter and cream cheese in a medium mixing bowl with the whisk attachment on medium high speed until fluffy. Scrape off the mixture from the whisk and replace with a paddle attachment. Add sugar, salt and vanilla extract and beat on medium to combine. Reduce mixer speed to low and slowly add the flour, mix until just combined. Scrape the dough out onto a well-floured board, and shape into a disk. Divide into two equal portions, shape each into a ball then flatten into a disk and wrap in plastic. Refrigerate for at least an hour. Pulverize the macadamia nut, and combine it with coconut flake and sugar in a small bowl, whisk to distribute evenly. Remove the dough from the refrigerator and roll out into a 9” circle, working with one disk of dough at a time. Spread 2 tablespoon guava butter over the dough circle, leaving about 1/4” from the edge clean. Sprinkle half of the nut filling over the fruit butter and lightly press it down into the dough. Cut the circle into 12 triangles using a pizza cutter. First cut the circle into quarters, then cut each quarter into thirds. Repeat with the remaining disk of dough, this time using the lilikoi butter, and place the baking sheet in the fridge to let the cookies rest. Beat one egg with a tablespoon of cream or milk to make egg wash. 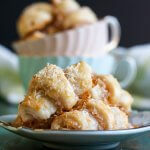 Combine 1 tablespoon of granulated sugar with 1 tablespoon of coconut flake in a pinch bowl for the topping. Brush egg wash all over the cookies, and sprinkle coconut sugar generously over the top. Bake for 18 minutes, until cookies are slightly brown. Nice! I make mine with Apricot jam filling, and sprinkle finely chopped pecans on top! Very similar recipe tho. This looks like an awesome little snack.